The goal of this project is to generate mice carrying mature human skeletal muscle tissue derived from individuals with Facioscapulohumeral Muscular Dystrophy (FSHD). FSHD is a common adult-onset muscular dystrophy, found with a frequency of 1 in ~8000 individuals worldwide, that is linked to contractions in the telomeric region of chromosome 4q. Current mouse models of FSHD do not replicate key aspects of the human disease, so we are developing methods to get diseased human muscle to form in mice. Our methods involve creating xenografts in mice of human myogenic precursor cells (hMPCs) immortalized from myoblasts obtained from FSHD patients and their nearest healthy relatives, and inducing them to develop into mature muscle tissue. Mice are immunocompromised, so that they cannot reject the human muscle tissue as it develops. Our approach is to X-irradiate the hindlimbs of mice, inject a myotoxin to cause the tibialis anterior muscle to degenerate, then inject the hMPCs. We typically then begin electrically stimulating the peroneal nerve feeding the engrafted area. 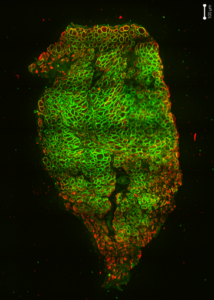 After a month, we obtain FSHD muscle tissue, as illustrated in the figure below The figure shows that nearly all the muscle fibers in the graft are human in origin, as they stain with antibodies specific for human β-spectrin (green). The red label, for desmin, is muscle-specific. Additional studies show the human muscle fibers in the grafts to be fully differentiated, innervated, and comprised of >98% human myonuclei. 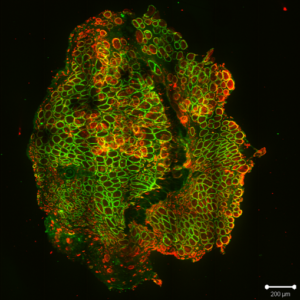 The hMPCs also repopulate the satellite cell niche of the grafts, suggesting that the grafts can continue to grow, or regenerate if they are damaged. Our laboratory is the first in the world to generate mature healthy and FSHD muscle tissue in mice from hMPCs. Importantlly, the grafts formed by FSHD hMPCs show the same genetic characteristics as diseased muscle, which are quite different from grafts formed by hMPCs from a healthy relative (Figure below; collaboration with Drs. Peter and Takako Jones). We are continuing to study the grafts to explore the pathophysiology of FSHD, and to develop them for use in testing therapeutics.